If you have a glass-half-full outlook, the mention of cruising ought to trigger memories of "The Love Boat" rather than, say, "Titanic." While some things stay the same - the purser, the cruise director and the bartender are still mainstays - modern cruise vacations have evolved to the point where many guests don't even leave the ship given the many activities on board. After spending a few days in Orlando to kick off our summer family vacation in August, we drove to Port Canaveral, where we dropped off our rental car and shuttled to Royal Caribbean's Enchantment of the Seas for a three-night trip to the Bahamas. The Enchantment, which sails year-round between Florida and the Bahamas, is part of an older class of ships in Royal's fleet but was overhauled in 2005. Eating is a big part of a cruise vacation. Meals are included in the cost - an "all inclusive resort" of sorts. Since we booked less than a week before departure, I was concerned that Royal wouldn't have enough time to stock the galley with gluten-free foods for our older son. We brought some bread and snacks with us just in case, but it wasn't needed. The ship wasn't going to depart until 4 p.m., so we ate lunch at the Windjammer Cafe, the only area open for lunch when we boarded. 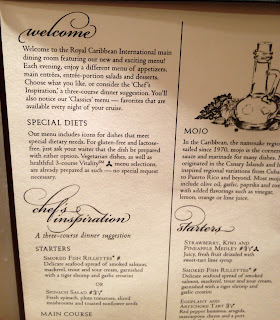 Knowing that the Windjammer is Royal's signature buffet option, I found a chef who pointed out that the gluten-free items were labeled. He also mentioned several other foods, like grilled fish, that were safe if prepared separately. The chef was kind enough to prepare a fresh fish fillet since he was concerned that the ones on the buffet could have been cross-contaminated by the soy sauce nearby. 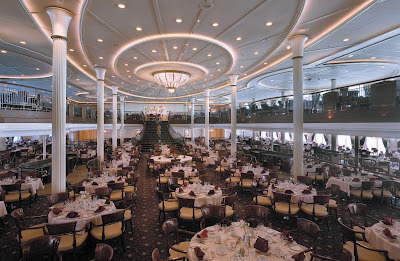 By the time we finished lunch, our staterooms were ready. We booked connecting interior rooms so that we had some space; bunk beds are normally used when four people are in a single cabin. The four of us spent some time at the pool before changing for dinner. (What would the house bands play for a poolside soundtrack if it wasn't for Bob Marley?) In addition to the buffet and a specialty steakhouse that has a $30-per-person surcharge, Royal has several dinner seating options. We chose the My Time Dining plan for the My Fair Lady main dining room. That allowed us to make a reservation within a three-hour window. Traditional early and late seating at set times is also available. Since the kitchens are cooking for many guests (about 2,400 on our trip), we didn't expect gourmet cuisine. Overall, our meals were above average, with pasta, vegetarian and fish options better choices than beef or chicken. The dinner menus each night listed gluten free, lactose free and vegetarian items, which made our older son's ordering painless. We found that the kitchen and waitstaff were well versed in gluten-free food handling, always checking to make sure our meals were satisfactory. We requested to be seated with the same group of servers each night since they were so helpful. The assistant waiter brought our son warm multigrain, white and tomato-basil bread each night, while the head waiter arranged for pancakes each morning and took our son's orders for future dinners to ensure safe preparation. There are standards like pasta and strip steak on the menu every evening, with a rotating selection of other choices like garlic tiger shrimp with steamed rice, eggplant Parmesan and horseradish-crusted Atlantic salmon. The standout gluten-free desserts included a Bailey's Irish Cream-infused crème brûlée, pot de crème and a flourless chocolate torte. There's a fitness center on board for a reason. Our post-dinner plans included visits to the Orpheum Theater each night. The weak Broadway song-and-dance revue on the last night was trumped by comedian Phil Palisoul's amusing set and an impressive performance by husband-and-wife illusionists David and Abi Haines. We also participated in a Michael Jackson trivia game and looked on with amusement as several guests competed in a "finish that lyric" contest. Many shore excursions can be booked directly with the operators for less than what they cost through the cruise lines themselves. 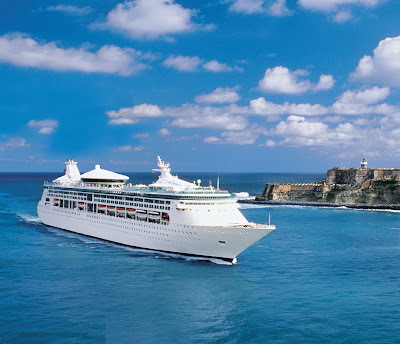 (The Cruise Critic website and message boards are great resources for researching cruise lines, ships and excursions.) We passed on visiting the Atlantis resort during the Enchantment's first port of call in Nassau and instead spent the day at the British Colonial Hilton's pool and private beach, a 10-minute walk from the cruise port. The day pass ($60 per adult/$30 per child) included a food-and-beverage credit ($40 per adult/$15 per child), so we ate lunch poolside. 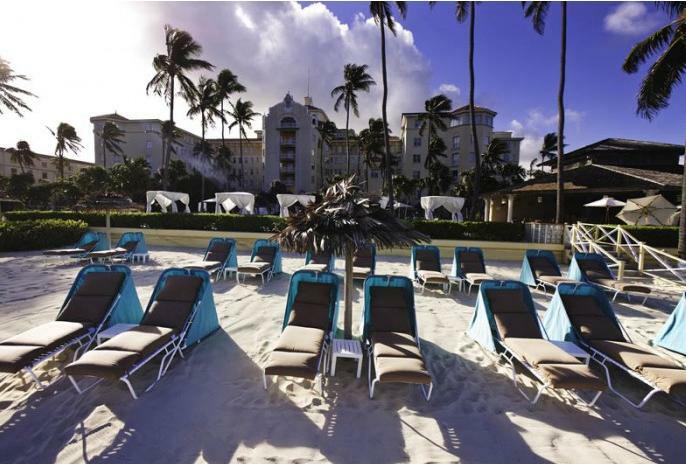 (The Sheraton Nassau Beach Resort has a $99-per-couple pass that includes beach access and a hotel room for the day but no food.) My wife spoke with the waitstaff at the Patio Bar & Grille about safe options, and our son ended up ordering a salad with grilled mahi mahi. After lunch, he and my wife took a two-hour snorkeling trip reserved directly through Blue Hole Water Sports, which is on the Hilton property. 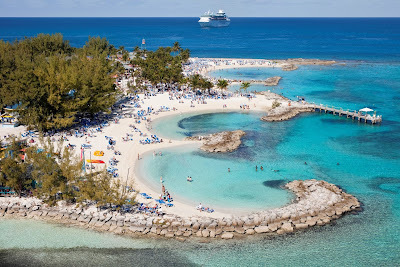 Our Day 3 destination was Royal Caribbean's private island in the Bahamas, CocoCay. Though it's largely an opportunity for the cruise line to take in more money, we enjoyed a leisurely day there lazing on our rented floating mats, wading in the ocean and watching the boys get soaked on the huge inflatable water slide. Lunch at the island is a barbecue, with burgers and hot dogs as the gluten-free options along with some sides. Our head waiter arranged for Udi's pre-wrapped gluten-free buns and cookies to be sent over for the lunch. I located a chef, who brought us those items, and used a fork to take untouched patties and toppings from the trays. 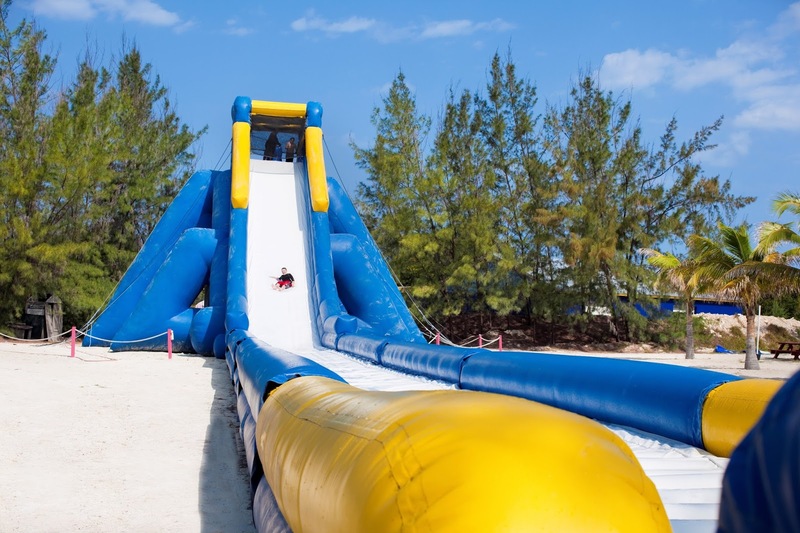 There are on-board activities for kids of all ages - from mixers to scavenger hunts - but since our tweenager and 10-year-old would have been in different groups, the boys largely skipped them and either stayed with us or hung out together on their own. Though there is Wi-Fi and wired internet access on the Enchantment, the prices are exorbitant (starting at $25 for 38 minutes prepaid or 75 cents a minute a la carte), so thankfully the ship is largely free of phone chatter. Sounds like you and the family had a great time! It seems like the cruise lines are getting better and better at doing gluten-free the right way. Glad to hear you found plenty of options! 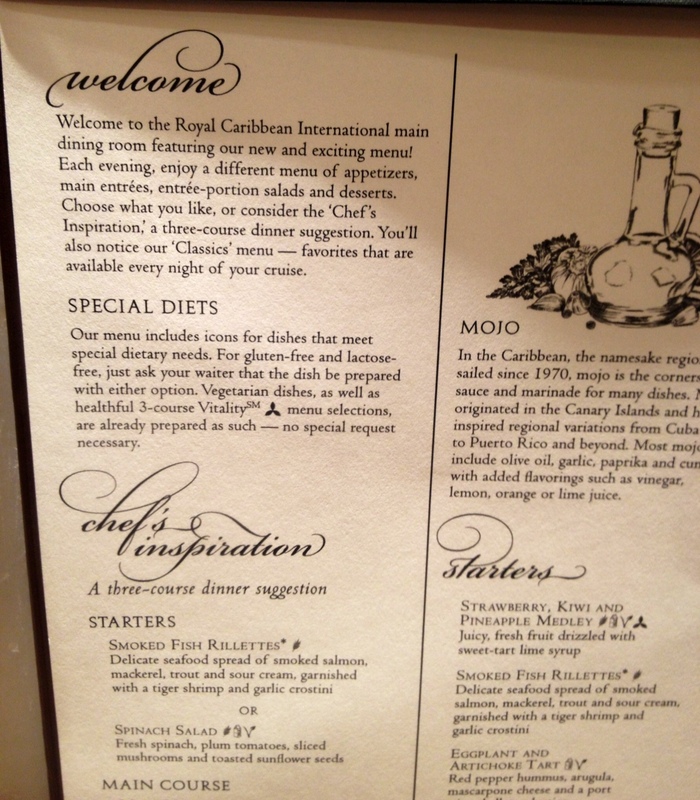 Heads up on Royal Caribbean Mariner of the Seas, Windjammer cafe. Of the items marked "gluten free", always check with the Main Chef, (not the person behind the line) to double confirm ingredients & gluten free status. Every day at least one marked item, was in fact, NOT gluten free. The one day I did not double check, I was exposed, and lost the one day I had in Thailand. I have not yet gotten a reply to my complaint. BTW the Main Dining Room was absolutely fantastic in service and in their ability to accommodate our gluten, dairy and egg free diet.